Two 20-26nt long reads are expressed from each of the two arms derived from a hairpin precursor. Because the ends of canonical miRNA reads are generated enzymatically, the 5’ ends of the reads are homogeneous (>90%). The hairpin precursor shows imperfect complementarity, and base pairs in at least 16 of the ~ 22 nucleotides. 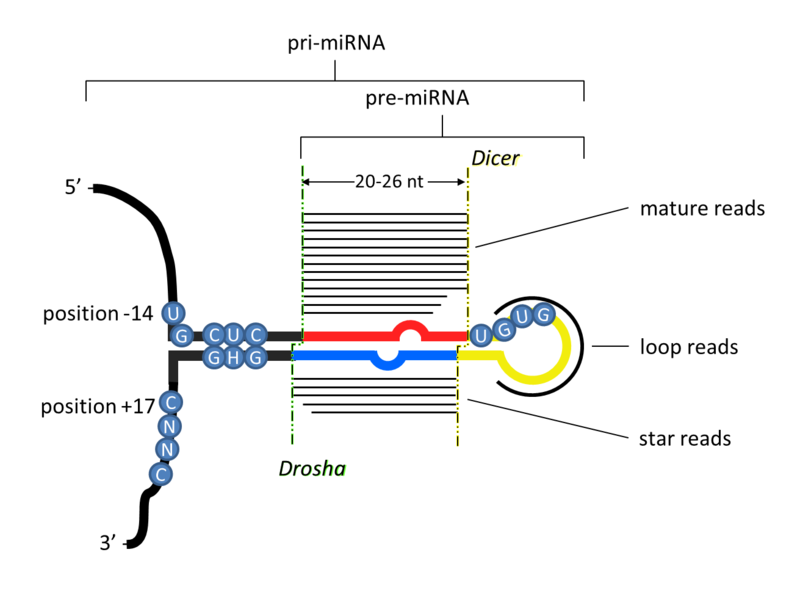 The 5p and 3p reads are offset by 2 nucleotides on both ends due to the sequential processing of the miRNA transcript by Drosha and Dicer to generate the mature ~22 nucleotide read(s). In some cases, the Drosha offset is only offset by 1 templated nucleotide, but in these cases the 3’ end of the 3p arm is monouridilyated (7,8). The length of the loop is at least 8 nucleotides long; there is no apparent maximum in loop length, even in organisms possessing only a single Dicer gene, contra (6), even though most taxa like vertebrates with single Dicer genes never show loop lengths greater than ~40 nucleotides. The mature miRNA sequence usually starts with A or U, and is often mismatched with the complementary arm, which seems to facilitate arm selection by Argonaute (at least in mammals) (6,9,10). Nucleotide positions 2 through 8 of the mature sequence (the "seed") are strongly conserved through evolution, as are positions 13-16 (the 3' complementary region) (6, 11). Processing motifs are often (but not always) present in the primary miRNA transcript including a UG motif 14 nucleotides upstream of the 5p arm, a UGU motif at the 3' end of the 5p arm, and a CNNC motif 17 nucleotides downstream of the 3p arm (12,13). Recognition and utilization of clear and, for the most part mechanistically well understood, criteria will allow the delineation of bona fide miRNAs from the myriad small RNAs generated in eukaryotic cells, allowing for deeper and robust insights into their function, possible mis-regulation, and evolution.